The Houston Astros made national news yesterday, and not just for their 3-2 loss to the Dodgers last night and George Springer’s thumb injury. The big news came before the game, when Astros General Manager Jeff Luhnow released a statement about the club’s quote “difficult decision” to add closer Roberto Osuna to its roster last week – even though he was still under a 75-game suspension for violating the league’s domestic violence policy. Osuna is facing criminal charges in Canada for allegedly assaulting his domestic partner; but the Candadian court system hasn’t fully released details of the charges. His court date has been reset to early September – yesterday, he joined the Astros’ active roster. According to a column in The Toronto Sun published over the weekend, The Astros had been interested in Osuna for more than a year; last year, The Blue Jays rejected their offer for the star closing pitcher. This year’s offer from the Houston Astros for the 23-year-old facing criminal charges was for about half of last year’s offer, according to the Toronto Sun. Today, I took part in a surprise “Home for the Holidays” celebration event where the Texas Sentinels Foundation handed over the keys to a refurbished home to a wounded Afghanistan veteran. As the event’s official photographer for the nonprofit organization, I feel honored to be able to help capture this moment in the Jesse Medina family’s life. The Foundation alerted their family and close friends – and everyone kept the secret. 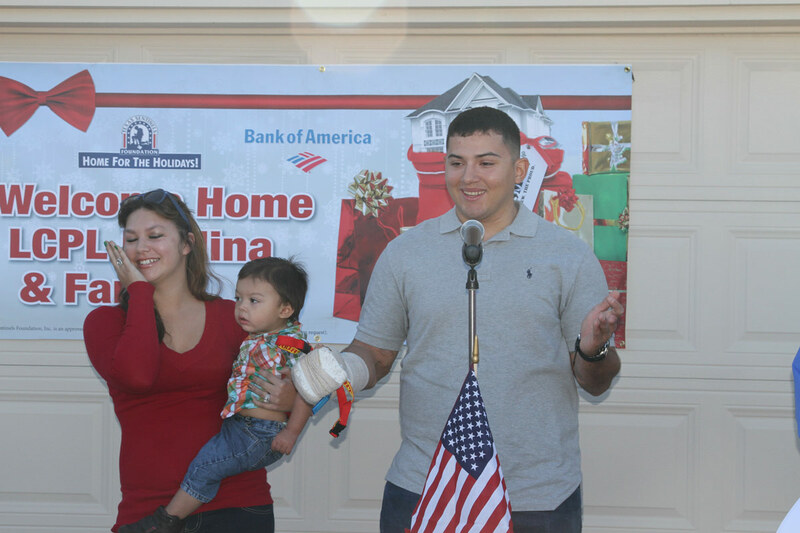 Marine Lance Corporal Jesse Medina and his family were surprised today by Bank of America and the Texas Sentinels Foundation with the keys to a debt-free, mortgage-free home in the Northcrest Village subdivision in Spring, Texas. They thought they were going to a Texas Sentinels Foundation Christmas luncheon. They were — lunch was served — but they didn’t know friends, family and local media would be there to congratulate them on their new home. 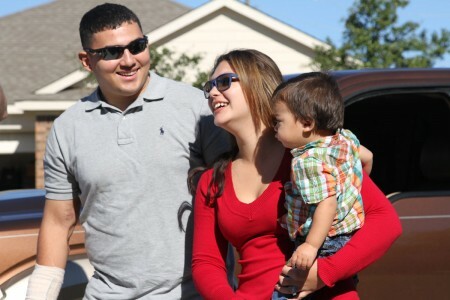 The Marine and his wife, Megan, and son, Aidan, received the keys to their new 2,348-square foot, 3-bedroom, 2-1/2-bath home and saw it for the first time after a brief key presentation ceremony. 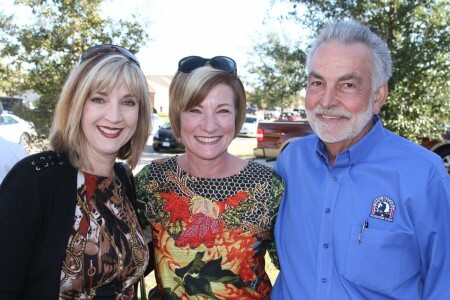 I wrote the press release about a new RE/MAX office that opened in Galveston. I then sent the press release to media contacts in the greater Houston region. The article, “RE/MAX Leading Edge now open in Galveston,” also contains autobiographies of each of the office’s owners that were submitted by them. The press release was also submitted to RE/MAX media relations and marketing professionals in Denver. RE/MAX Leading Edge in Galveston opened its doors today for business and is owned by four successful local Galveston resident Realtors. RE/MAX franchise Broker/Owners Kelly Kelley, Nicki Huprich and Sales Associate/Owners Ryan Moody and Frank Burgy are prepared to meet all of the real estate needs on the Island. Located at 3616 7 Mile Road on the edge of the West End of Galveston, the office is highly visible to full time Galveston residents as well as the second home and resort market. Today, I published an article I wrote about RE/MAX DFW Associates REALTOR Cindy Bogle to the RE/MAX of Texas News Online website. 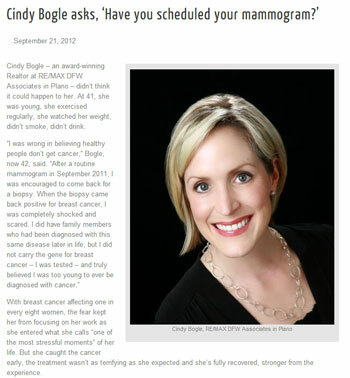 Cindy Bogle – an award-winning Realtor at RE/MAX DFW Associates in Plano – didn’t think it could happen to her. At 41, she was young, she exercised regularly, she watched her weight, didn’t smoke, didn’t drink. 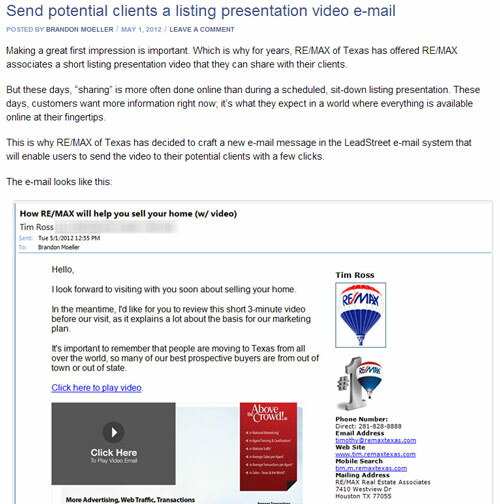 Today, I wrote and published an article titled “Send potential clients a listing presentation video e-mail” on the RE/MAX of Texas News Online website that instructs RE/MAX agents how to use the powerful LeadStreet platform to send a video listing presentation to prospective clients. I created the e-mail message in the LeadStreet system (RelianceNetworks). When the prospective client receives the message, it links to a page that I developed that includes art designed by Brian Miller and that contains an embedded video produced by Mike Sumerlin. I’m proud of this story because it communicates the value to its audience of the content we create for RE/MAX Realtors in Texas to use to increase their business. The story was one of the most popular ones I wrote and posted on the RE/MAX of Texas News Online website. Today, I published a story I wrote about a group of communication students and alumni who are working on a special film project to educate local youth about HIV and AIDS. I wrote this story about UH communication students, took all of the photos and designed the page for the web. The questions come from a concerned aunt, standing between her niece and the door, arms crossed and defiant. It’s a scene from a new series of videos called Caught Off Guard that 17 students from the Jack J. Valenti School of Communication are working on to promote HIV education and STD awareness to high school students in Houston. The “Aunt Tamika” character is played by Ameka Jackson, a UH-Downtown psychology student. The character’s name is a play off of the name of Caught Off Guard writer and director Tamecia Henderson, a media production major and business management minor who is gaining real-world experience in the film industry between classes and coursework. Today, a story I wrote about Psychology professor Julia Babcock was published to the College of Liberal Arts and Social Sciences website. The story is part of the ongoing Faculty Spotlight series. I also took the photo of Dr. Babcock that accompanies the story. A faculty spotlight article I wrote about Dr. Julia Babcock. 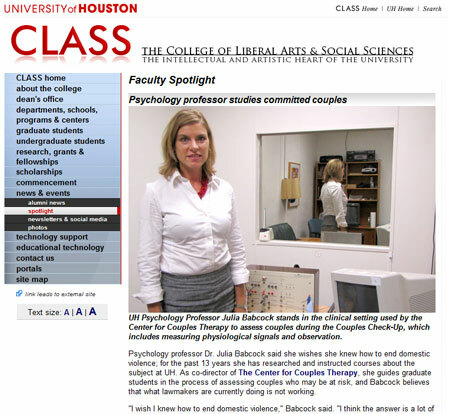 Psychology professor Dr. Julia Babcock said she wishes she knew how to end domestic violence; for the past 13 years she has researched and instructed courses about the subject at UH. As co-director of The Center for Couples Therapy, she guides graduate students in the process of assessing couples who may be at risk, and Babcock believes that what lawmakers are currently doing is not working.